That’s the way I remember the summer of 1955, when my best friend, Sally, and I worked at Sawyer’s Dairy Bar, across pastures from the Sawyer farmhouse in Gilford, New Hampshire. It was the summer between our sophomore and junior years in high school. We were sixteen, and this was our first job, besides babysitting. Our first official job. 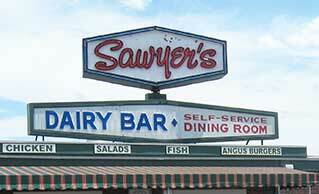 Sawyer’s is still there, in larger form, with a restaurant added on to the original little dairy bar. Each year after Sawyer’s opens for the season, Don and I still go there, and that’s where we were this year on a rainy May 29 for the start of Sawyer’s sixty-eighth season, when a man our age came up to our booth and introduced himself. Larry Litchfield, the new owner. Much amusement! I told him about working here with Sally. He asked if I’d like to see the latest renovations in the old dairy-bar section. Would I?! So Larry took me backstage, into the area where George Sawyer used to make the ice cream and Larry’s wife, Pati, now does. Sawyer’s Dairy had delivered milk out of this part of the building too. I was suddenly disoriented; things had changed, perhaps during the rebuilding after a fire. 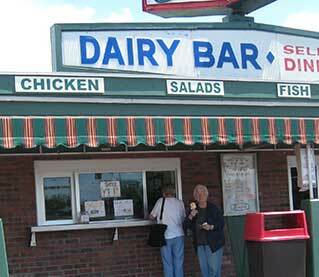 Then Larry ushered me into the dairy bar and told the young woman at the counter that I used to work here. I added, “The summer of nineteen-fifty-five.” We all laughed about how very long ago that was. Prehistoric to the young woman, I’m sure. 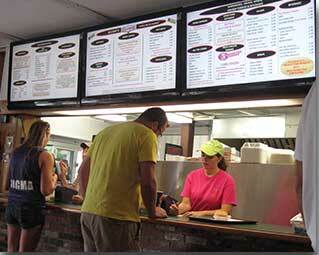 Larry explained that the front wall of the dairy bar had been moved forward to make more space. It sure was roomy compared with the cramped quarters we had worked in, where we’d have to sprawl across the ice-cream cabinets to get to the lemon sherbet or some other not-so-popular flavor at the back. As I thanked Larry for the tour, I said, “I wish Sally could have been here!” But Sally lives in South Carolina, so I couldn’t have given her a call and told her to rush over to join us. Back in high school, however, Sally lived near Sawyer’s, on Varney Point on Lake Winnipesaukee. I lived farther away in Laconia, about a twenty-minute drive, and although I had got my driver’s license, my family owned only one car (typical in those days) and thus my mother or father had to drive me to work and pick me up after. So I stayed over at Sally’s even more than usual that summer, and we would walk to work together down the narrow road past cottages and Gilford Beach, in our white nylon uniforms, white nylon aprons, white socks and sneakers. We began work in June after school let out. We didn’t work a full day; the schedule was divvied up amongst Sally and me and two other high-school girls. Our hours varied, sometimes starting in the morning, sometimes in the afternoon. On Fridays Sally and I worked until closing time (eleven o’clock) and had to be back to open up Saturday mornings at ten, with a midday break that sometimes included a swim at Gilford Beach, then back to work until closing. I’d always been an early bird, but for the first time in my life I found myself wanting to sleep late those Saturday mornings. Ruth Sawyer, George’s wife, a very nice woman with whom I joked about the coincidence of our first name, taught Sally and me how to make change: “Count backward.” I’d been trying to do math in my head, always a challenge, particularly so in this case because the cones cost thirteen cents for a small and seventeen cents for a large, not simpler ten and twenty cents. Then came the Fourth of July. We didn’t sit down again. The place was busy. We were always glad if people asked for a hamburger and we could say that we only served ice cream, directing them to a nearby lunch stand. What we lived in dread of was the arrival of busloads of little boys from a nearby summer camp. When we walked home to Sally’s from work in the evening, our white uniforms would be smeared with ice cream, hot fudge, hot butterscotch. Across the road from Sally’s house was path that was a right-of-way to the lake. On occasion we stopped and went swimming there, stripping to our underwear or skinny-dipping or walking straight into the water in our disgusting uniforms. One time we attracted bloodsuckers. You can imagine the eeks. The diary entry in One Minus One about working in a dairy bar is of course a fictionalized version of my diary entries that summer. Don too spent the summer of 1955 involved with dairy products. He worked for Horne’s Dairy in Winnisquam, near Laconia. For him, the summer of 1955 was his summer between high school and college. Horne’s had a dairy bar, very small, but Don didn’t work there; he drove a pickup truck stacked with cases of jangling milk bottles to deliver to customers on a summer-cottages route around Lake Winnisquam. Also cream, buttermilk, cottage cheese, and ice. He made about twenty-five dollars a week, which seemed a fabulous sum to me. I was making twelve-something dollars a week plus tips, of which there weren’t many in a dairy bar. (No paper cup on the counter labeled College Fund back then.) On Saturday nights he’d pick me up after work, laugh at my bedraggled state, and drive me the short distance to Sally’s, where we’d sit in his car in the driveway and discuss the dairy business. And get up to other things, of course. I do remember that we actually did discuss the newfangled homogenized milk as opposed to milk with the cream on top you had to shake in or pour off into a creamer. Much as I loved staying at Sally’s, the commuting problem made me start thinking of working nearer home the next summer. Sally decided she would like a change, and thus we both got jobs waitressing at a Main Street restaurant, Keller’s, which later became the inspiration for Sweetland in The Cheerleader. Sally’s commute was the same as during the school year; her parents would drop her off at my house on their way to work. So Sally and I still walked to our summer job together. And thanks to Keller’s soda fountain, the summer of 1956 was also ice-creamy.